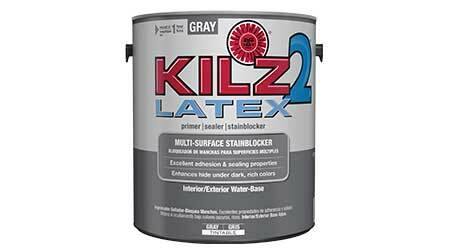 KILZ 2 Gray Primer is a fast drying, water-based, multi-surface primer-sealer and stain blocker best used under dark, rich, and vibrant colored topcoats. KILZ 2 Gray Primer helps achieve more accurate color with fewer coats of paint and also improves hiding of previous colors, with excellent adhesion and sealing properties and a very mild odor. Blocks "medium" stains including water stains, rust, grease, ink, pencil, and felt marker. Use on interior and exterior surfaces including woodwork, drywall, plaster, paneling, masonry, brick, painted metal, and properly prepared glossy surfaces. Use under or over latex or oil-based paints.